Great news for foodies in Quintana Roo! The First Annual Cancun-Riviera Maya Wine & Food Festival has been announced for March 15-18, 2012. 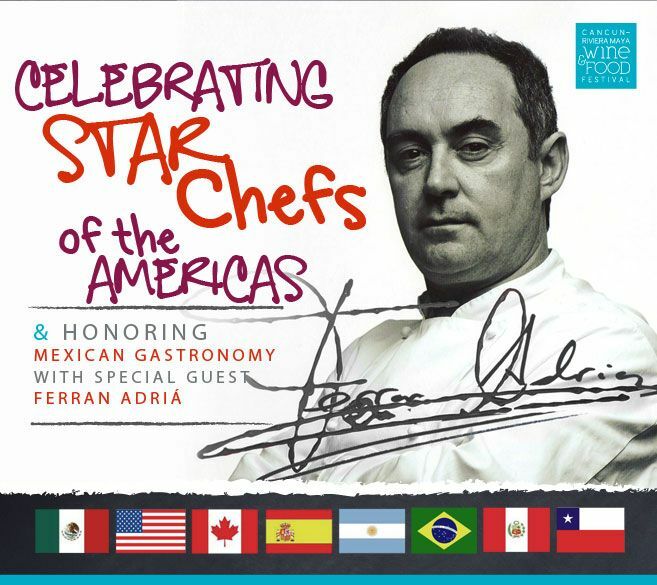 It's a culinary all-star line up with such notable Chefs as Jacques Pepin, Patricia Quintana, Aaron Sanchez, Ingrid Hoffman and the incomparable Ferran Adria among many others! Festival highlights will include an 8 course molecular gastronomy dinner prepared by top Mexican chefs who worked and studied under Adria's tutelage at his world famous "elBulli" in Spain paired with the finest Spanish wines selected especially for this event. This is a once in a lifetime opportunity for gourmands and oenophiles alike! Meet the best Argentinian & Brazilian Grill Chefs "Parrilladas" and enjoy a fiesta featuring surprise entertainment and fireworks. Sample the best tequilas, vodkas, martinis, tapas and sinful desserts; all while moving to the rhythms created by a top DJ, to take you late into the night. Combine the Cancun-Riviera Maya Wine & Food Festival with a travel destination that no other festival can match: World class beaches, awesome Mayan sites, Spanish haciendas and colonial villages, magical underground pools "cenotes", snorkeling or diving at the world's second largest barrier reef, high seas fishing, ecological parks and pristine islands, fun adventure tours for all ages, an easily accessible airport, and a wide variety of hotels for all budgets. The Festival is committed to giving back to our community. The beneficiary for year one is the Ciudad de la Alegria – The City of Joy. We will be supporting its goal to empower disadvantaged children, victims of violence & care for the elderly. Tickets ON SALE: October 1st, 2011. Tickets subject to availability.